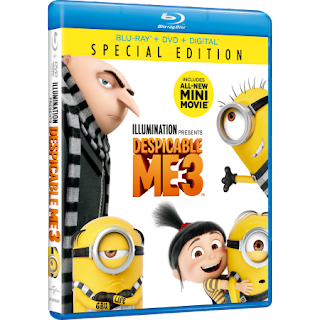 Hurry over to Amazon or Walmart.com to score Despicable Me 3 Blu-ray + DVD + Digital for just $9.99 (Retail $22.98)! Illumination, who brought moviegoers Despicable Me, Despicable Me 2, and the biggest animated hit of 2015, Minions, continues the story of Gru, Lucy, their adorable daughtersMargo, Edith and Agnesand the Minions in Despicable Me 3. After he is fired from the Anti-Villain League for failing to take down Balthazar Bratt, the latest bad guy to threaten humanity, Gru finds himself in the midst of a major identity crisis. But when a mysterious stranger shows up to inform Gru that he has a long-lost twin brothera brother who desperately wishes to follow in his twin's despicable footstepsone former super-villain will rediscover just how good it feels to be bad.